Just like humans‚ your beloved pets can suffer from heart problems and vascular diseases. They can be caused by obesity (which can be prevented with a healthy diet and regular exercise) or heartworm (which certain medications can prevent or treat). However‚ these diseases are often genetic‚ and there isn’t much that you can do to prevent them in your dog or cat. The recommended dosage—unless otherwise advised by your vet—of Formula CV for Pets is one capsule per 25 to 50 pounds of weight daily for dogs. For cats‚ the recommended dose is ½ capsules a day. 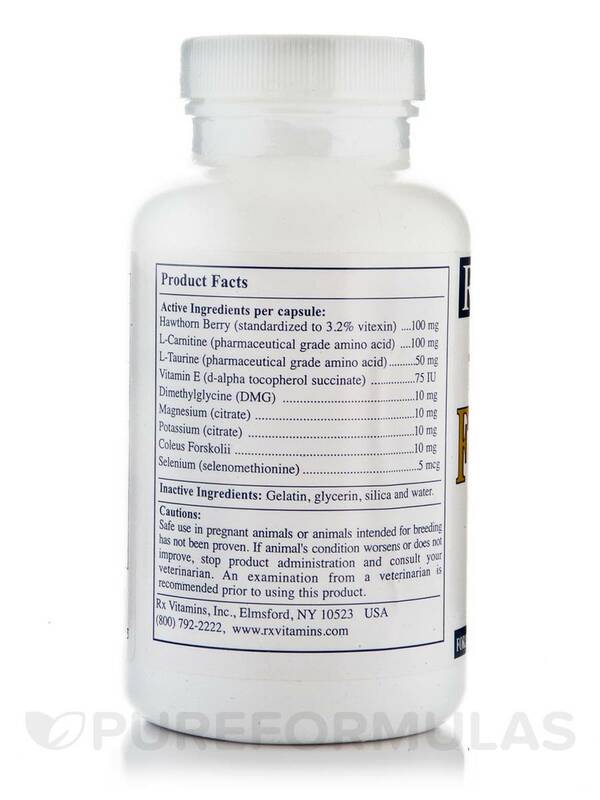 Since its founding‚ RX Vitamins has been dedicated to producing state-of-the-art and innovative nutraceuticals specific to each health condition. Health care practitioners have come to know Rx Vitamins as a producer of dependable‚ high-quality‚ effective nutritional supplements available at reasonable prices; its products are often recommended to them by fellow clinicians. 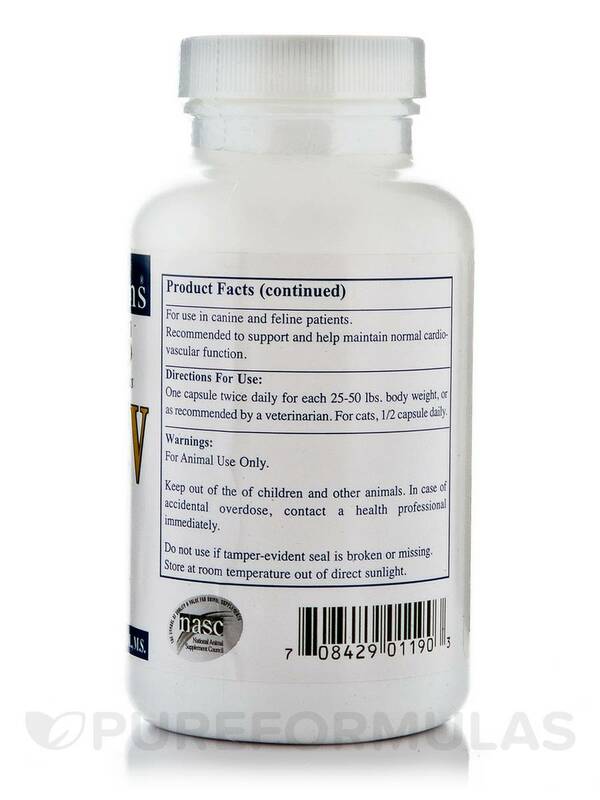 Rx Vitamins has become well known as a trustworthy source of health-enhancing products that can be counted on to help both human and animal patients‚ due to scientific research. One capsule twice daily for each 25-50 lbs. Body weight‚ or as recommended by a veterinarian. For cats‚ 1/2 capsule daily. 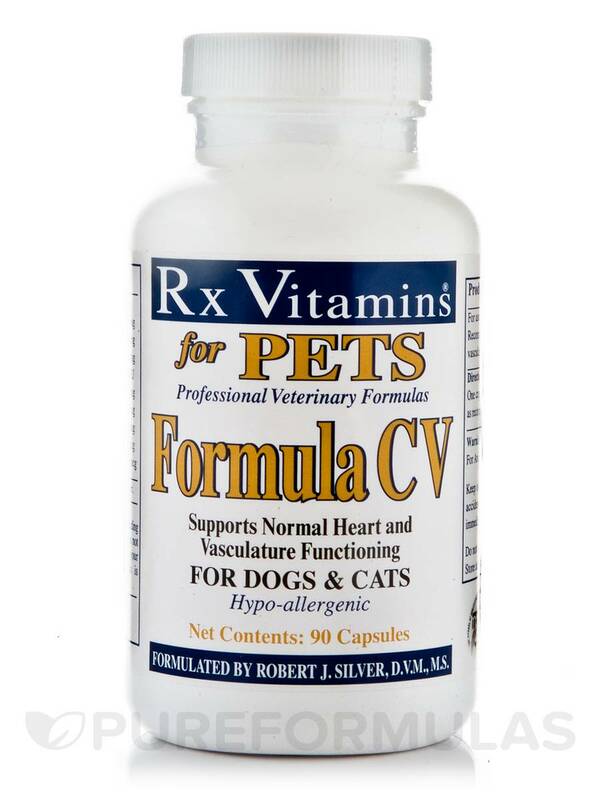 Vet recommended Formula CV for Pets (Dogs & Cats) by Rx Vitamins for my dog while she is being treated for heartworms--light case and on the slow-kill method. She takes the pill twice daily with her food and she doesn't reject it. It's too soon to know if it is helping, but ingredients are beneficial for human cardio function so I'm sure they will be beneficial. I will reorder. Formula CV for Pets by Rx Vitamins was recommended by my holisitc vet for my 12 year old chihuahua who has heart disease. She had a very bad reaction to the Vetmedin that was prescribed by our traditional vet but does great on this. Has been on it for two years now. I like that it is natural and I can open up the capsule and sprinkle it on food (she is a 6lb chihuahua and these capsules are big). I have nothing bad to say about this product. Recommend by my border collies veterinarian for a grade one heart murmur. He has been taking Formula CV Rx Vitamins for over a year and has as much energy today as my too much younger dogs. Just grateful a product like this is available on the market today. Formula CV is a great product! My veterinarian recommended Formula CV for Pets by RX Vitamins for my senior dog rather than starting her on prescription heart drugs. My dog seemed to have more energy soon after starting it. Vet also said it can be used as an adjunct to prescription heart drugs. I like Formula CV for Pets because it is made from ingredients found in nature and does not have the toxicity of traditional cardiac drugs. It is also much more economical. I have no negatives to report regarding Formula CV. I've been using Formula CV by Rx Vitamins for my 15 year old dog with great results for the past 5 years. Formula CV was prescribed by my Vet. to help my dogs heart murmur. I am very happy with the product and the price is right too. I will be reordering again. Thank you. I am trying to order your Formula CV for Pets, and it says there are 3 left. I am trying to order 1 bottle and it says it's not available in the amount that I want. Do you not have any more of this product? Hello Melissa, yes we have 3 available. If you need assistance please give us a call so we can place your order.